Looking for not just a place to swim in Switzerland this summer but a family friendly hike to go along with it? Then why no take the “GoldiFamilien-Safari” from Klewenalp to Seelisberg and visit the Strandbad Seelisberg along the way. Mum of 3 Suzy has done just that and shares with us this spectacular Badi location in the heart of Switzerland. Strandbadi Seelisberg, Seelistrasse 4 6377 Seelisberg. By car: via exit Beckenried south to Seelisberg. There is no direct parking at the Badi, just metered parking (about 5 chf a day) on the Dorfstrasse as you enter the village, from where there is a 5 min walk along a footpath. Public Transport: With Postauto from Stans to the Geissweg bustop. Alternatively you can arrive to Treib via the Vierwaldstättersee-Schifffahrt, then take the cable car up to Seelisberg. 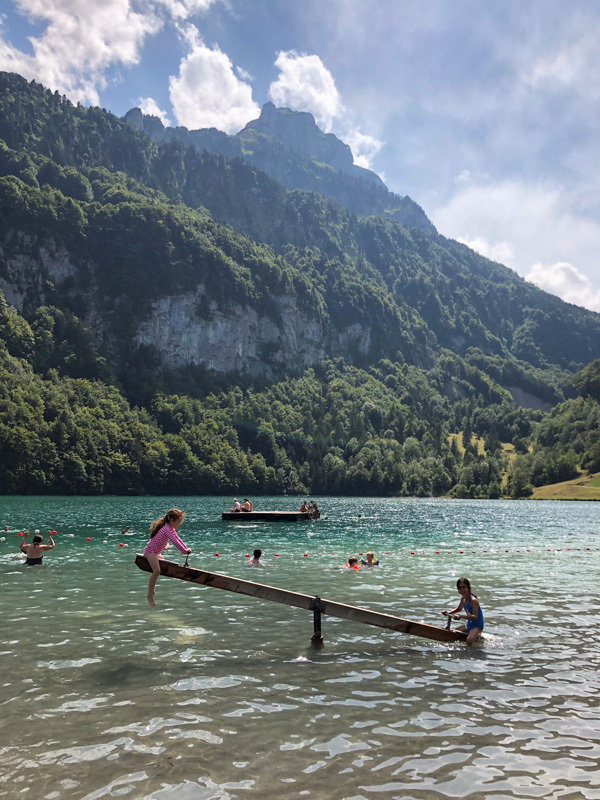 For a longer adventure that involves a hike, grill, a sail and a cable car journey, the Badi Seelisberg forms part of the Goldifamiliensafari (click Angebot Familiensafari for a map) offer from Klewenalp to Seelisberg . The spectacular location of this Badi is what makes it a special destination. It's a great one to wow guests from abroad, during the week is very quiet and gives the impression of being the area's best kept secret... The waters are crystal clear and there are spring boards, platforms and even a water seesaw to keep younger ones entertained. The badi is part of a Naturcamping area so you could make an overnight of it too if you so fancied. Badi restaurant is standard fare, but convenient to grab a meal, quick snack or an ice cream. I’m Suzy wife of Ari, a British mother of two boys and a little girl, with whom I have lived in Zug, Switzerland for the last 7 years. Having worked as a clinical pharmacist in London for many years, my time is now occupied by running around after my family and dragging them around to discover the beautiful experiences Switzerland has to offer. In other moments I can be found trying to master the dual disciplines of German and Swiss German, singing in a local choir and enjoying the occasional glass of something cool and sparkling with friends. If you favourite place to swim in Switzerland has yet to be shared, pop over to the “My Badi” page, scroll down to the easy to fill out questions and your’s could be the next feature!